I touched on the relative lack of volume and how this has historically marked tops, rather than spurred on rallies. Another troubling volume development is the ratio of volume on the Nasdaq compared to the NYSE. We are seeing a spike in this ratio, meaning that Nasdaq volume is significantly more than NYSE volume. Since the Nasdaq represents the riskier side of the market, this has usually meant that there is too much froth in the market. Last week I pointed out the danger of having the AAII remain at 53% bullish when the market had gone down slightly. Although this week the AAII respondents were slightly less bullish (45%) it is good to see their excitement abate in the face of a week that saw the market go up. This reversal however only slightly dilutes the contrarian bearish meaning of this indicator. We are still at a very high level of bullishness. Simply by receding from the extreme level of bullishness that we saw last week does not eliminate the topping signal that the AAII is giving us at this point. 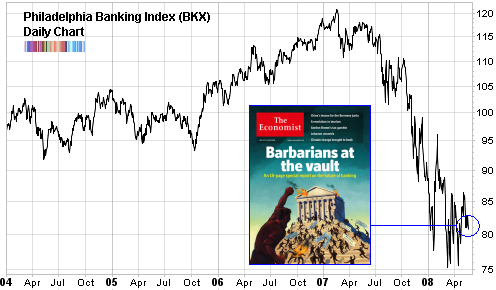 After all, it was in October 2007 when we last saw this sentiment measure at such heights. Investor’s Intelligence, the measure of newsletter sentiment compiled by ChartCraft, showed little change going from 44.4% bullish to 46% bullish. In contrast to the sentiment surveys mentioned above, the Hulbert Stock Newsletter Sentiment Index is continuing to suggest that newsletter editor are still either skeptical of the market’s recovery or not really excited by it. At the start of the week, the HSNSI was 16.2%, meaning that the average market timing newsletter was suggesting to their clients being long just 16.2% of their portfolio. This is much lower than the 27.5% which they were recommending in late April, even though at that time the market was lower than it is now. Slicing and dicing the newsletters, Hulber finds that the stock market newsletters with the best track record of timing the market are continuing to be bullish, while those that have lagged buy and hold are much less so. This gap in sentiment and performance has, however, significantly diminished from mid-March - when the market hit its inflection point. A reader already asked about the lack of updates from LowRisk. I emailed Jeff Walker, the keeper of the data and when or if I receive a reply I’ll write a follow up. The last update on their site is for March 23rd 2008. I haven’t received any email updates either - I’m subscribed. In any case, LowRisk was never one of the major sentiment surveys that I relied on. It was a bit too volatile and no one except Walker knew the size of the sample size. Check out the Economist’s “prowling bear” cover in 2006. As disclosure, I’m long the AMEX Financial Select Sector ETF (XLF).